There were British consuls in Christiania from 1805. Norway was ceded by the Danes in 1814 to Sweden, with which it was united until declaring its independence in 1905. After a plebiscite, a Danish prince was elected King of Norway, and he took the name of Haakon VII (Haakon VI died in 1380). Christiania was re-named Oslo in 1924. The first British minister to this new royal court was Sir Arthur Herbert, who started looking straightaway for somewhere suitable to live. An excellent house was available but the Treasury set their face against it as too expensive, at about £25,000 including ingoings, in the belief that a leased property should be the objective. After further searching, Herbert found no suitable houses to lease but four to buy, and argued that the house that had previously been rejected was the best prospect. 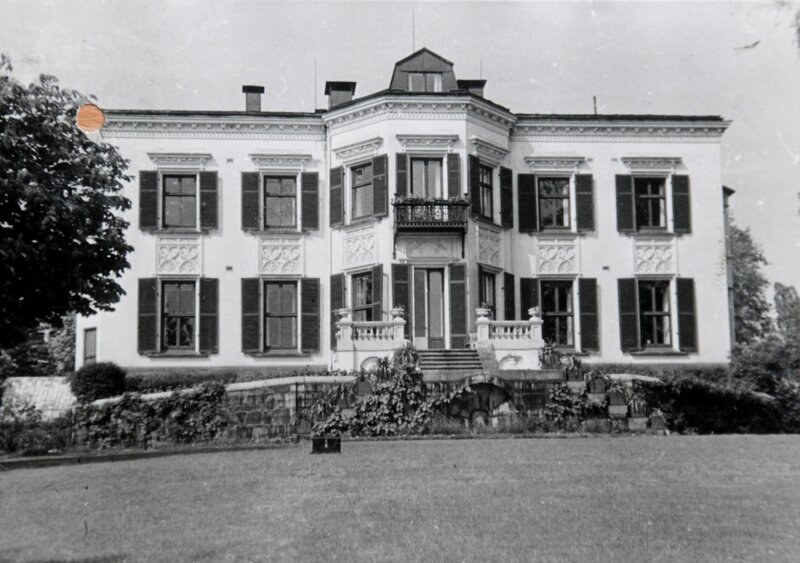 This house was called Villa Frognæs, after the original Frogner Estate on part of which it stood. Its land, nearly thirty acres, was bought in 1852 by Thomas Johannessen Heftye, whose Swiss grandfather had settled in Norway and founded the bank that bore his name. Heftye built the house in 1856-9, employing a successful local German-educated architect, Heinrich Ernst Schirmer. The house has been described (see Note below) as standing out ‘in the history of Norwegian architecture as marking the transition between late neo-classicism and Gothic revival.’ Heftye laid out the grounds that sloped gently down towards the fjord inlet at Frognerkilen, in a grand romantic manner, including the conservatory, comprising greenhouses on either side of a billiards room, and the coach house, being stables and a hayloft. 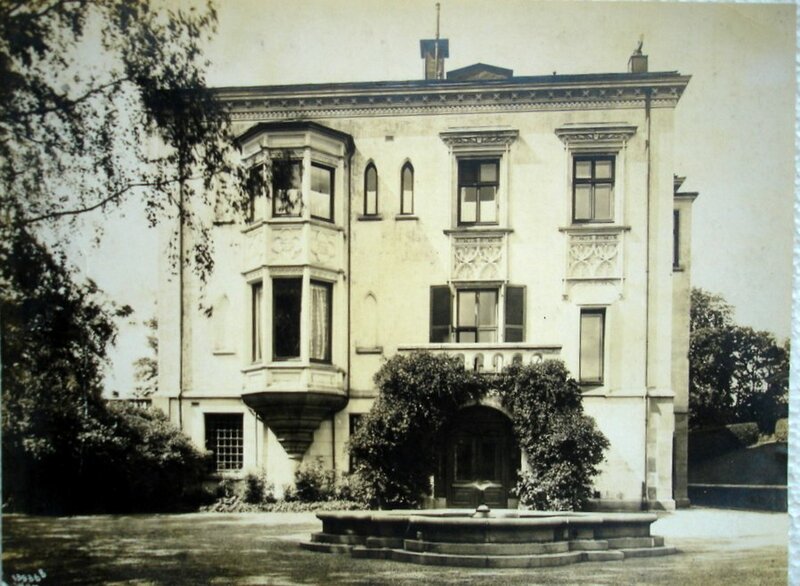 Heftye lived at Villa Frognæs in considerable and hospitable style until his death in 1886. The gatehouse was built in 1891, while the property was enduring twenty years of being unloved through several owners and tenants, including for a short spell the German consul-general, long periods of standing empty, and all but the six acres surrounding the Villa being sold off. By 1906, the owner was a Thomas Fearnley, who had English antecedents, and he was keen to negotiate a sale. Herbert had a strong hand to play: everybody thought Villa Frognæs was the right house for the British legation; the legation secretary, Stephen Leech, was a good friend of the First Commissioner of Works, Lewis Harcourt; and Edward VII would likely be paying visits to Christiania to see his youngest daughter, Maud, who was King Haakon’s Queen. Herbert got the purchase price of Villa Frognæs down to £18,000, although the ingoings estimate had gone up to £6,000, including furniture for the State rooms. He took an option on the house, lest the soon-to-arrive new German minister would snap it up. The Treasury relented, Parliament approved and the purchase deal went through in July 1906. Richard Allison, an architect in the Office of Works in London, was put in charge of the ingoings, in liaison with a local architect, Kristian H Biong. The legation offices were at first housed on the lower ground floor with the kitchens and service areas, but a one-storey wing for them was attached to the north-west corner of the house some years later. A further floor of offices was added to this wing in 1938. A small piece of land at the north-west corner was ceded for road-widening in 1931. Switzerland was the protecting power during the Second World War: the house was locked up and left untouched for its duration, and the gardens became very overgrown. They were extensively renovated in 1946, and the area to the west of the house re-designed by Eyvind Strøm, a local landscape architect. In the course of this work, the base of Heftye’s fountain was moved from its site in front of the porte cochère to the new rose garden. Two UK staff flats were inserted into the house in the early 1970s, one in the upper floor of annex, the other over the garage. The house was listed by the Norwegian authorities in the early 1980s. It was restored and modernised in the mid-1980s, requiring the ambassador to be out-housed for a year. John Cornforth was intimately concerned with the interiors and liaised closely with the National Heritage staff. Perhaps their chief focus was on the Oval Room, the remarkable heart of the house on the first floor, which is entered from the (original) ballroom on its west, the drawing room on its east, the (original) dining room on its north, and the garden terrace to its south. 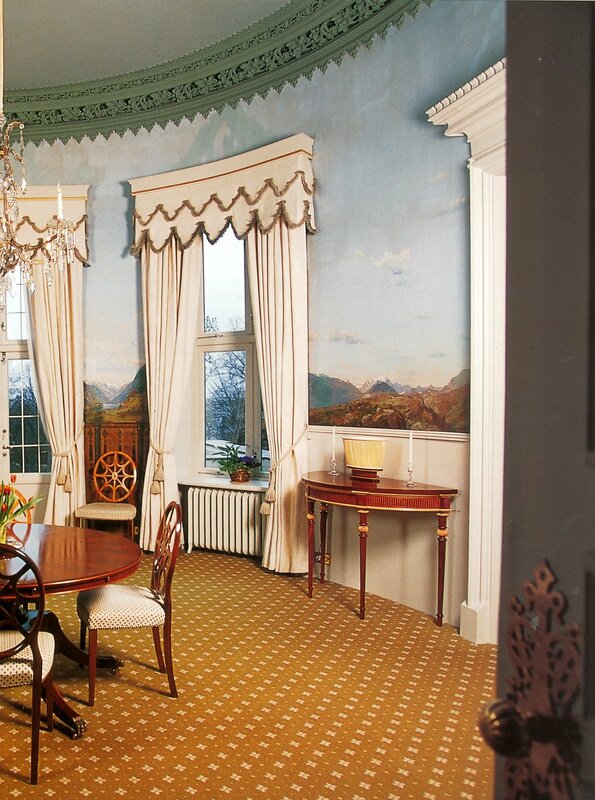 The entire wall space in the Oval Room above the dado is painted with exquisite romantic Norwegian landscapes, 1858-9, by Johan Fredrik Eckersberg: a painted rustic balustrade originally extended below the dado to the floor, as witnessed by the short sections on either side of the terrace doors that were exposed and restored in 1988. The evidence suggests that the romantic veranda illusion was also originally completed by painted trellis and leaves connecting the balustrade to the plasterwork vines of the cornice. Schemes were considered during the 1980s for building a few houses close to the west boundary and overlooking Tostrus Terrace, but planning approval was never forthcoming. In 1989, the dilapidated conservatory building was converted to a UK staff house. 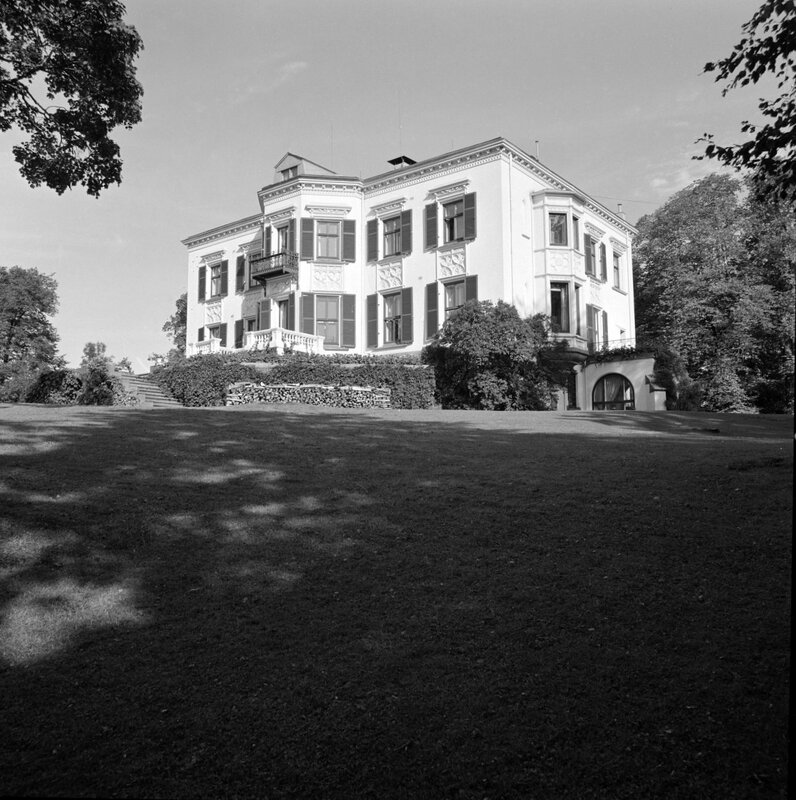 An illustrated booklet by Dr Stephan Tschudi-Madsen, The British Ambassador’s Residence at Oslo, published (with Norwegian and English texts) by the British Embassy in 2001, gives a fuller picture of Villa Frognæs. John Cornforth, in an article entitled Spirited Relationships published in Country Life 11 April 1991, described the pieces that he commissioned for the Oslo residence, on behalf of the FCO, from Francis Johnson. 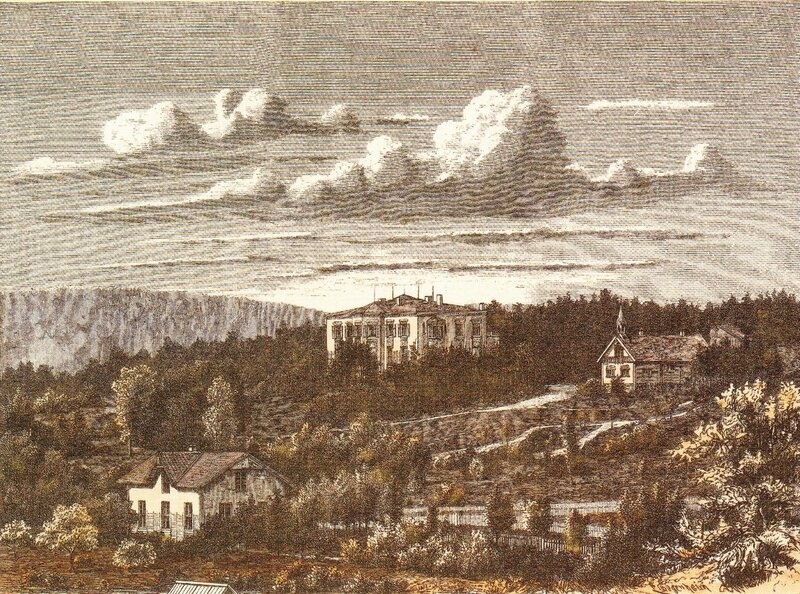 Engraving of Villa Frognaes, 1865. 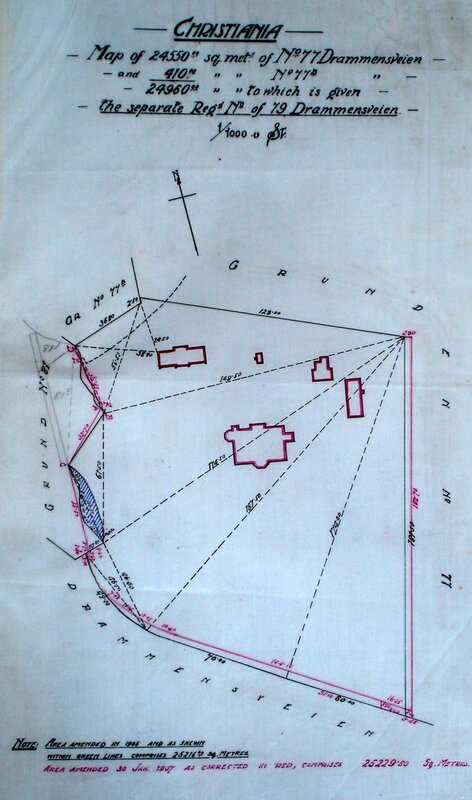 Site plan of Villa Frognaes, 1907. 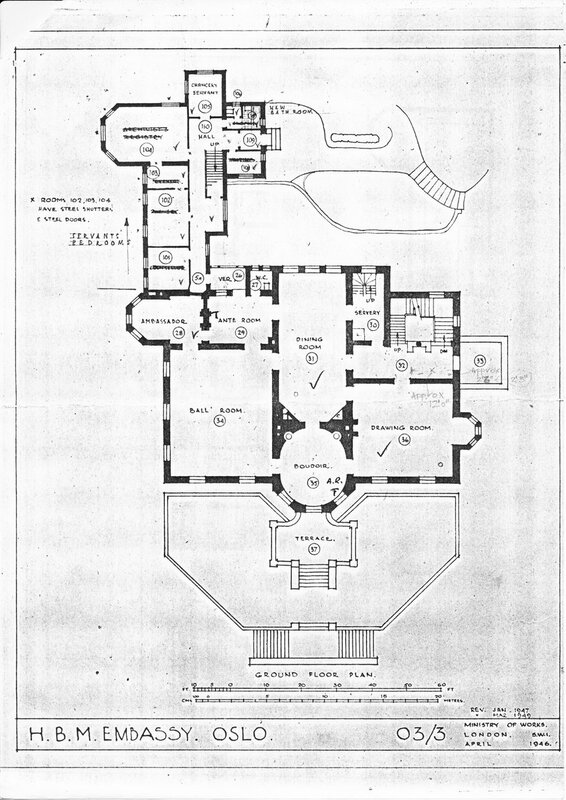 Main floor plan, with Oval Room, and chancery annexe, 1946. 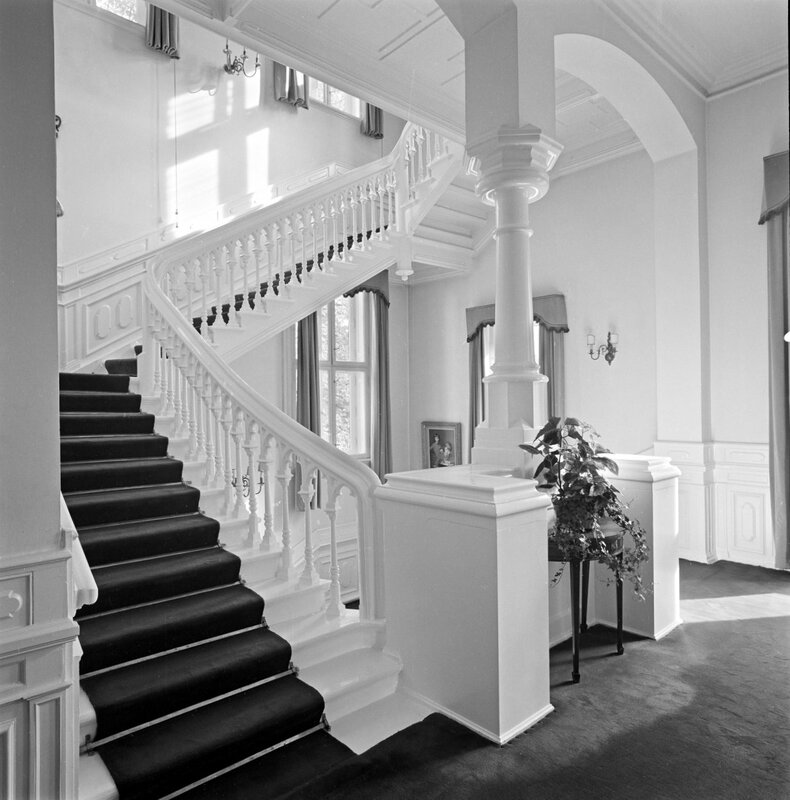 Hall, on lower ground floor, and stair to main floor, 1966. 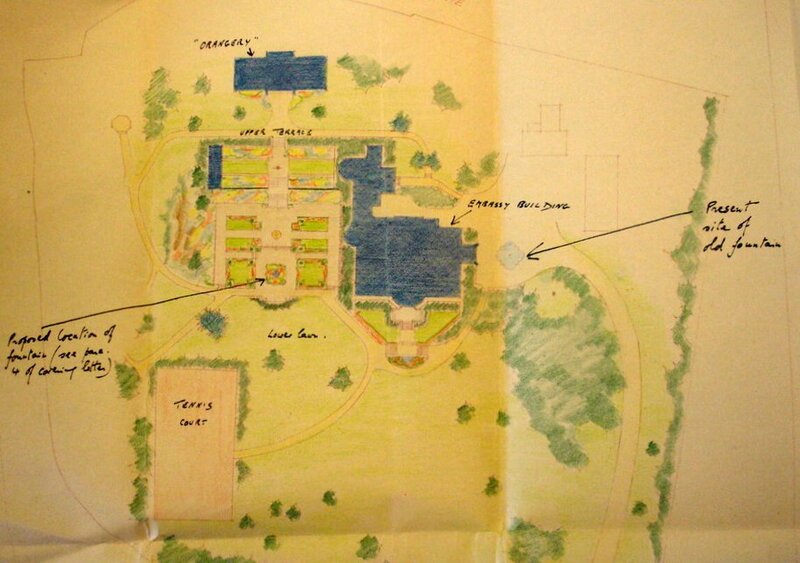 Proposals for garden improvements, 1945. These were executed the following year. 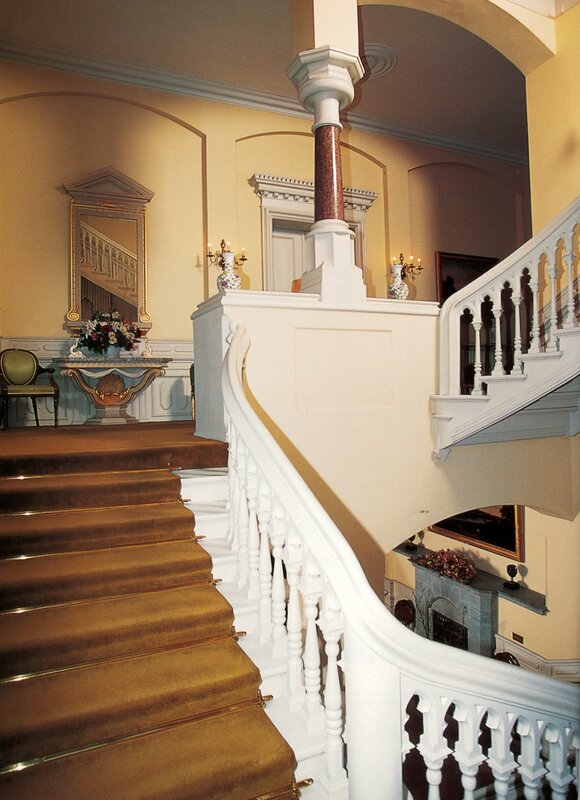 Stair, with Francis Johnson pier glass and table on the landing, 1990s. Oval Room, looking south-west, 1990s. 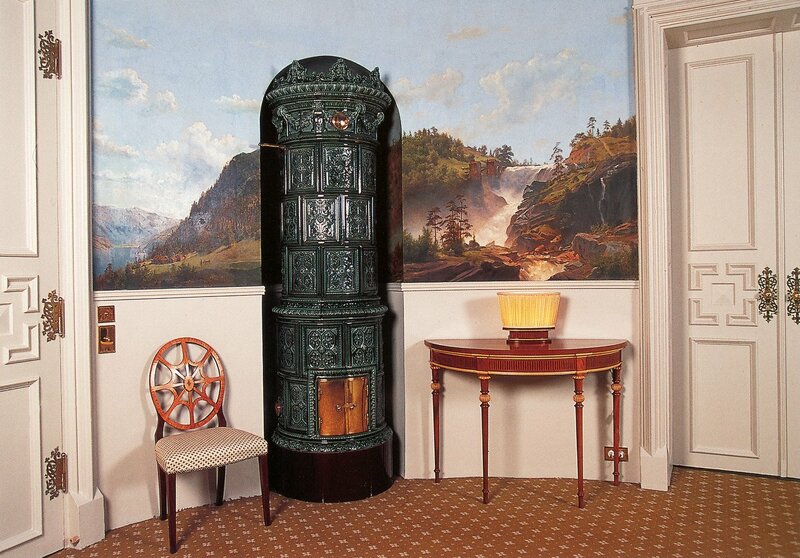 Oval Room, with one of two Swedish stoves, and one of four Eckersberg paintings, 1990s. The offices moved out of the annexe at Villa Frognæs in 1950 into the third and fourth floors of 4 Drammenswein, known as the Glitne Building. In 1963, the consulate alone moved back to the annexe. 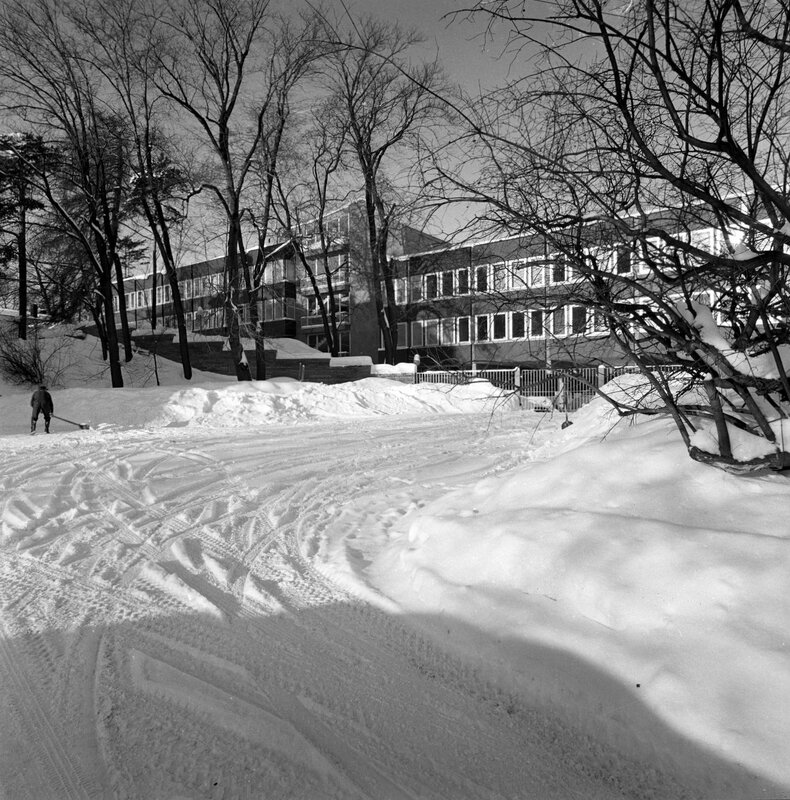 South side of the offices, viewed from within residence grounds, 1966. 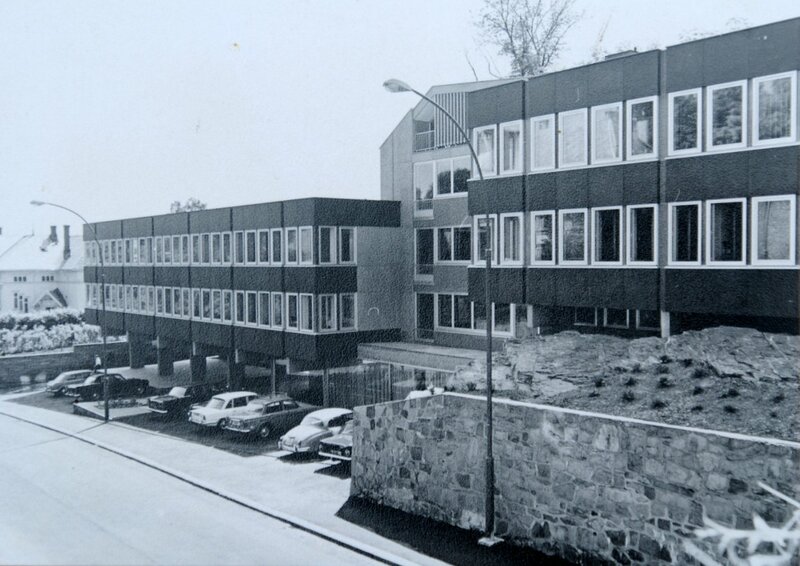 Offices, from the north-west, 1960s.